This is Luis Perez. Probably. According to Adam Caplan of Sirius XM Radio, the Philadelphia Eagles are expected to work out quarterback Luis Perez, formerly of the Birmingham Iron, of the now cancelled Alliance of American Football league. 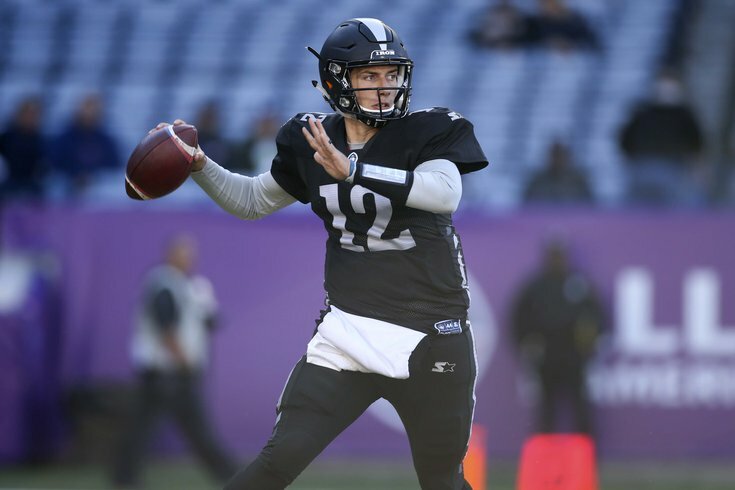 Former @aafiron QB Luis Perez is expected to work out for the #Eagles next week. He's one of bunch of former @TheAAF players to have workouts in the near future with #NFL teams. Back in February, we noted three AAF players who might make sense for the Eagles, and we featured Perez. Broken clocks, and whatnot, I guess. Because of the tough nature of the Philadelphia media, when the Eagles bring in players for their 30 allotted pre-draft visits, they set up mock press conferences in which team employees ask difficult questions and try to rattle the young prospects. It was a piece of the process in which Carson Wentz impressed the team. It may sound silly to put stock in that kind of thing, but it is something that the team absolutely cares about, especially at the quarterback position. Perez ended the season with pretty crappy numbers. He completed 135 of 258 passes (52.3%) for 1460 yards (5.7 YPA), 5 TDs and 6 INTs, though personally, I have no idea what to make of stats -- good or bad -- from that league. The Iron finished the season with a 5-3 record. The Eagles are on the hunt for a third quarterback to develop this offseason, and if they could pluck one with legitimate skills from the AAF instead of using a draft pick on one, that would make a lot of sense. From Perez's perspective, it would it make sense to join the Eagles for a chance to make the team, seeing as the Eagles have had obvious success developing Wentz, Nick Foles, and Nate Sudfeld.